CBS: MACGYVER looked like a sleeper hit when it premiered 2 weeks ago, but since then it’s been heading straight down. It fell 0.2 from last week (after a 0.4 drop from the week before) to 1.1, switching it from CBS’s highest-rated Friday show to its lowest. 1.1 is still an OK number for that slot, but any additional erosion would be dangerous. HAWAII 5-0 held at 1.3, and BLUE BLOODS was down 0.1 to 1.2. FOX: HELL’S KITCHEN was steady at 1.0, and THE EXORCIST gained 0.1 to a still-ugly 0.7. 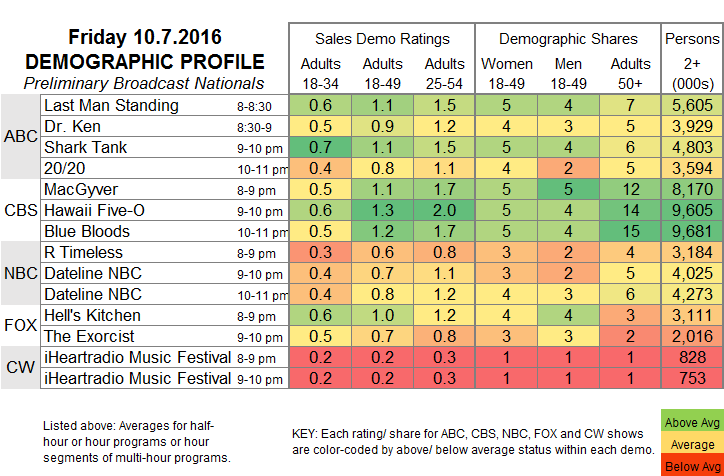 ABC: LAST MAN STANDING remained at 1.1, and DR KEN rose 0.1 to 0.9. SHARK TANK stayed at 1.1, while 20/20 lost 0.1 to 0.8. NBC: After a 0.6 rerun of THIS IS US, a 2-hour DATELINE was down 0.2 from last week’s edition to 0.8. CW: The second half of the IHEARTRADIO MUSIC FESTIVAL special was at 0.2. COLLEGE FOOTBALL and NASCAR will occupy most of the networks tonight. Sunday will be dominated by a PRESIDENTIAL DEBATE that thanks to recent events may be even bigger than the first one, while HBO will introduce its new Sunday comedies, DIVORCE and INSECURE.